Every Fashion Week, I look forward to Robert Verdi’s Fashion Week Retreat. Its held in his Luxe Laboratory and usually features some really cool, new brands and trusted ones, as well. It provides a welcome respite for weary fashion show attendees to freshen up or just relax with good food. I paid a visit today and had so much fun! 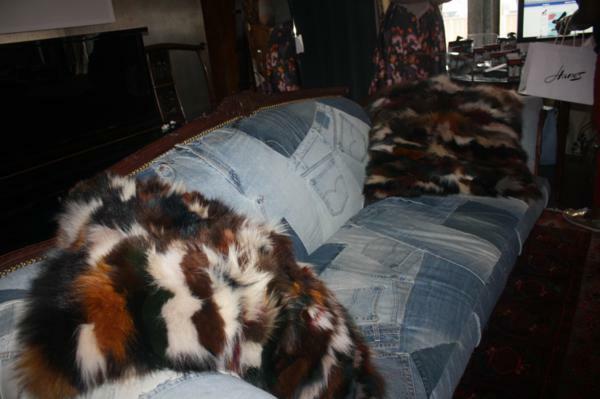 I LOVE his couch made of his old jeans! Okay, I get easily side tracked. Here’s a peak at the beauty side of things. I got my makeup done by Maybelline. Maybelline is the official makeup of Fashion Week. Melissa Silver of Maybelline, freshened up my look by adding frosty lips and deepening my black winged eyes. Melissa told me that Maybelline did the makeup for tons of shows this season, more notably BCBGMAXAZRIA, Custo Barcelona and Vivienne Tam. She shared with me the secrets of these looks and the exact products used so you can recreate them at home. For BCBGMAXAZRIA, the look was all about the glamorous eyes. Fit Me! foundation was used for an even canvas with Fit Me! blush in Medium Coral. Color Sensational Pearls Lipcolor in So Pearly was used for a toned down lip. Plush Silk Eye Shadow in Give Me Gold was used and finished with Great Lash Mascara in Very Black. For Custo Barcelona, they were loving dramatic feminine lips. They used Fit Me! as the base and finished with Color Sensational Lip Color in Ruby Star. For a daring look, apply lip color with a brush. At Vivienne Tam, porcelain perfect skin took the cake. Fit Me! foundation and blush was used, coupled with winged eyes courtesy Eye Studio Lasting Drama Gel Eyeliner in Blackest Black. For the lips, the models sported Color Sensational Lipcolor in Born With It. 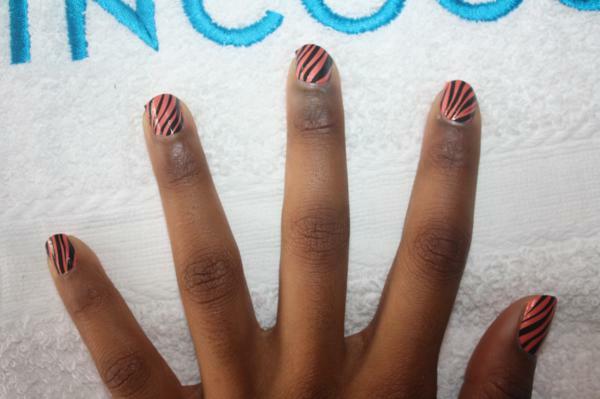 I also got my nails done by one of my favorite brands, Incoco. I think I first picked up a pack of their nails a few years ago at Walgreens or Duane Reade and fell in love with how easy it made my manicure. I have a habit of doing my nails before going to bed and letting them dry overnight. With Incoco, there is NO drying time. You literally peel, stick, press and its over. Its not a sticker, though. Its 100% Nail Polish strips. Its a 3 in 1 manicure. The top coat, color and base coat are fused together somehow into 1 little strip. It lasts about 10 days and comes off like nail polish. They have so many fun new designs now that you can do AT HOME. I am so obsessed with these. No drying times means no smudges and no bubbles. All 3 layers in 1 means you save money on nail polish. its win-win all around. Check out their website at www.incoco.com. More to come about the other fun brands, including Band-Aids by Cynthia Rowley (why not? ), boat shoes by Sebago, a new flavor of Muscle Milk and energy in a strip…as in Listerine strip!